This is Orlando the Marmalade Cat II, also known as Brolando, Lando Catrissian, and Fat Boy. We are trying hard to not let him become a truly obese cat, but he’s such a snuggler, he gets far more treats than he should. Notice that he is so intent upon his position on my lap that I can actually crochet right on top of him. I actually finished the shawl with him right there. He won’t tolerate hardback books though. Before I paused to take the picture, my daughter came in and exclaimed, “AWWWW!! you are so cozy!” Yes, very. 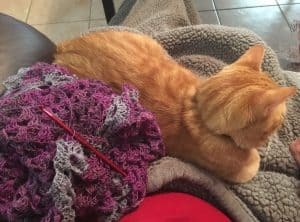 A lot has been said about the mentally restorative powers of yarn arts and pet ownership, some very serious scientists have researched these avenues to healing and found very positive results. Every pet owner can corroborate the peace that the unconditional love our pets give us. But those of us who work with yarn frequently, know this ‘mindfulness’ that they speak of. We have known it since the very first time we hit ‘the zone’. Making stitch after stitch, focused only on the rhythm of the pattern, mind completely focused on the flow and rhythm of the project in hand. 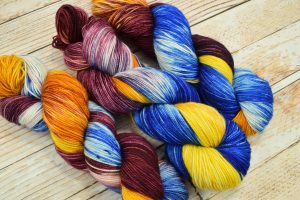 This mindfulness of yarn work allows one to let go of other worries, if only for a little while. But it’s a break our minds need. Then the phone rings or the baby cries or a car horn honks and we are shaken out of our peaceful state. I remember the first time it happened, my youngest was a toddler and I’d been learning crochet for maybe three or four months. I know I was doing ordinary rows of double crochet, focused on creating a square and not a trapezoid. She woke from her nap peacefully, I could hear her talking to the air the way toddlers do. I started to put the project away and had to do a double take. Not only were my edges beautifully even and square, but I had crocheted for almost two linear feet, it was half a baby blanket! I looked at the clock, an hour and a half had passed in complete peace. I remember thinking “ah, this is ‘the zone’ they talk about”. I know this zone of mental peace can be achieved via other methods, like running, but you can’t run with a cat on your lap. And there’s all the sweating. That’s the yarn side of it, but there is more to being cozy than just working on something peacefully. The Danish have known this for a long time, their word is one that has probably entered your realm in the last year or so: hygge. This was definitely a hygge moment for me. What you don’t see in the picture is my husband to my right, reading, and a mug of hot tea to my left. All I was missing was some chocolate. It was an ‘extra frosting on top’ type of night in that I finished the shawl. So satisfying. I slept well. 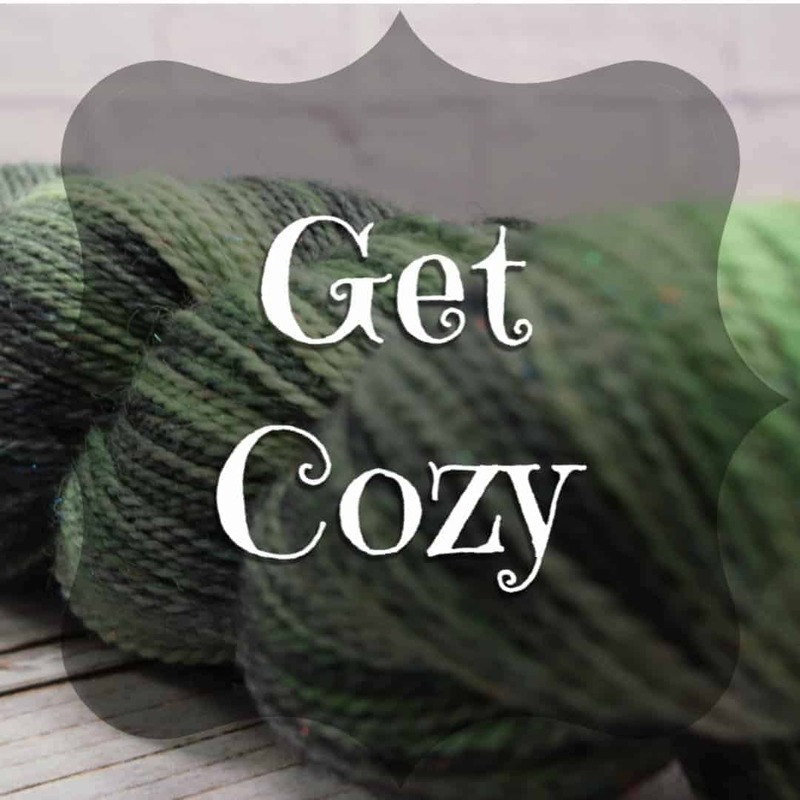 So, the next time you sit down to do a few rows, don’t just grab the yarn and plop in your favorite chair, get cozy. Make the tea, grab a blanket, call the dog over. Not only will it instill guilt in anyone attempting to disturb you, your existential being will be better for the deeper mindfulness you achieve in the time given. And the project at hand will turn out beautifully. I’m a ‘bag lady’. I have a work bag, a knitting bag, a crochet bag, an embroidery bag, a whole bunch of reusable grocery totes that occasionally become secondary project bags, a bag in my car with emergency supplies, a tool bag, and as I look around my crafting space I currently have a bag of clean and empty Oui yogurt jars and a bag of pecans waiting to be shelled. Yup, bags are my primary organizational system. In my knitting bag, I have a needle roll with 60% of my needles in it. The huge clunky ones are in a jar in my craft space, along with same-size-different-length needles on the longer side. My crochet bag has a hook roll. Neither of these organizers really hold any tools. Those tool bags are the bags I’m going to talk about today. The little tool bags inside the big bags are all small zipper totes, all roughly 9” x 9 ” x 1 1/2” and similar to cosmetic bags. Inside my knitting bag and both* crochet bags, I have quite a few common items. a couple yards scrap yarn. This is rolled into a little ball no bigger than a jawbreaker candy. My knitting bag has a few things my crochet bags don’t: cable needles in several sizes, some point protectors, a crochet hook, and some vintage safety-pin-looking stitch holders. So, what’s the reasoning behind these? Some are pretty obvious, but I’ll elaborate on the less obvious. I don’t write small, this size allows me to put a full sentence reminder to myself. It’s big enough to do math on. It’s small enough to not dominate the zipper bag and go in and out easily. I use singles as place markers in my patterns, underlining the row I’m on, the size really blocks out following rows well for easy focus (sometimes I block the above rows too). I can put one off to the side to make tally marks on to keep counts in various patterns. And when I’m in public, I stick one to my business card with additional information because I’m always telling people where they can take a class from me. I’ve tried ordinary note pads, bigger and smaller, but Post-It’s are just plain awesome and this size works exceptionally well for me. If you write small you may be happier with smaller ones, but a sticky type beats plain paper every day. A Ticonderoga pencil specifically, because it’s real wood and they are well made for about 3 cents more than those awful plastic ones. I stock up on supplies at back-to-school time. I have also found the fun kid and holiday motif pencils sold at Target and Michael’s are often really good wood too and have had several in my bags over the years. My work crochet bag has a red pencil with white polka dots and blue flowers. I do not use mechanical pencils, because those require a hard surface to write on. The fine lead will just poke a hole in your paper if it’s on your knee because you are working in the doctors office waiting room. I feel no concern writing on my pattern, making a tiny note in a book, or scribbling out the math for a project if I’m using pencil. That’s what erasers are for, and I carry a big one. The other reason I carry a separate eraser is that the ones that come on pencils are never big enough. I like the Pink Pearl type in my bag. I like the ones that fit over the pencil’s eraser, but I’ve found they don’t hold up well in a bag. Too much movement cracks them, then you have little bits of eraser all through your bag. These don’t really get used for knitting or crochet. I have them there for giving away. In an emergency, me and my yarn bag look like a good source of rescue to those having wardrobe malfunctions. 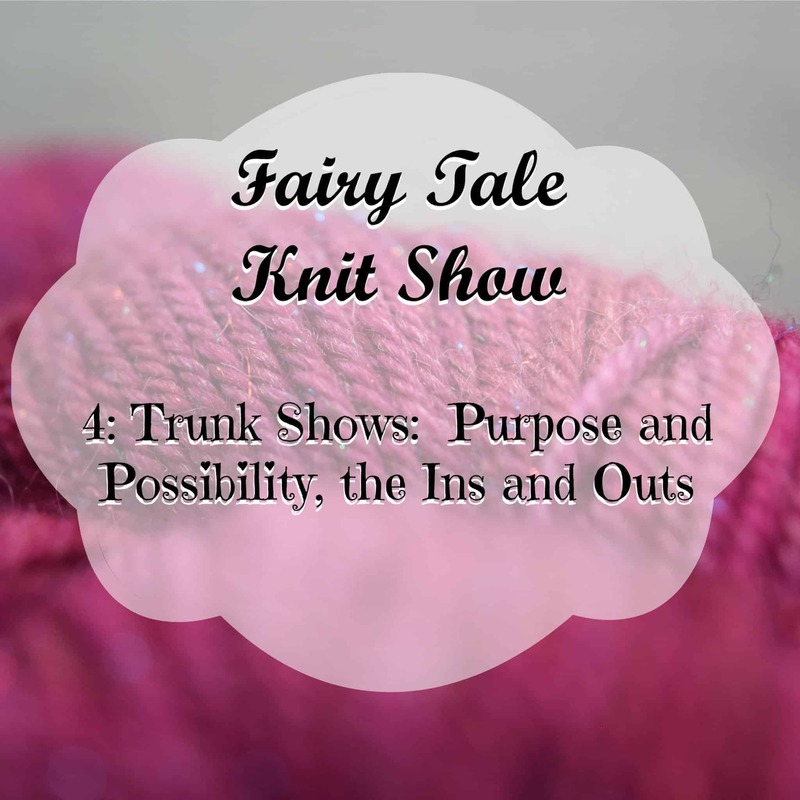 It’s sort of passive advertising, and non-crafty people don’t know that knitters do not have a needle and thread on their person at all times. I keep my bags stocked because that guy on the bus who just realized his fly wasn’t down but broken is going to look for the craftiest looking person he can to get him out of a pinch. The young mother whose purse strap just bit the dust, the toddler whose lovey just lost it’s arm, all have sought me out in public because of my yarn bag. “Um, well, this is crochet, but I have a safety pin” has flooded needy strangers with relief on many occasions. It’s an opportunity to be a Good Citizen. The Clover company has an amazing array of tools and products for all kinds of fiber arts, I own many of them. I’m really happy with their quality too. But they have yet to improve on the humble bobby pin. I suppose this is a bit of a ‘hack’, but it is really just practical and frugal. Nothing Clover sells can be got in the quantity of 50 for a dollar. I feel no guilt losing or giving them away at that cost. So how do I use them? They are my ‘locks’ when I put my project back in the bag. For crochet, I slip it through the loop on the hook, then down over the completed rows. For knitting, I slide one on each end of my needle(s) through the front of the stitches. They won’t snag the yarn. If it comes off the needle/ hook, it holds the loops from un-looping and to each other. They can be got in several sizes and occasionally fun colors (look in the kid section of the hair accessory section the next time you are at a dollar store). And, you can put them in your hair to keep it out of your face while working. This is useful in a bunch of ways. 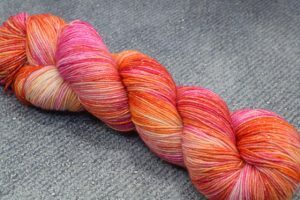 I have a large skein of Red Heart in a hideous orange I got in a freecycle box. It’s my primary source of scrap yarn balls as it’s not a yarn I’d ever make a gift from or wear myself. It’s really the most dreadful shade of orange ever produced. Scrap yarn is often called for in knitting for the trying on or holding stitches instructions. In crochet, I’ll sometimes swatch a stitch or section before going to it in my good yarn on my project. I use it to demonstrate the basics when that curious kid comes and starts asking lots of questions in random public places. I’ve even given it away to children after teaching them how to make a chain using just their fingers. It’s another Good Citizen thing, and the yarn was free. So, that’s more than you ever needed to know about what’s in my bag. What’s in your bag? 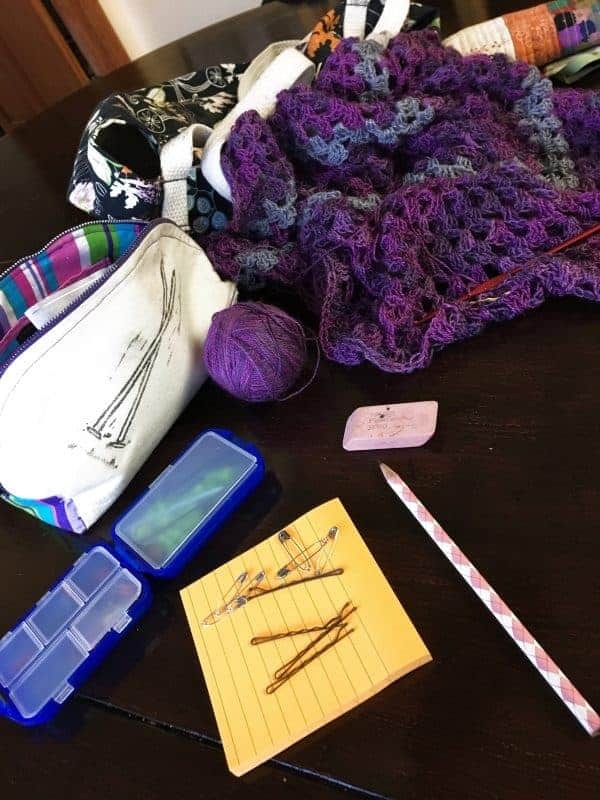 *because I teach crochet, I have one that lives at work permanently along with a few hooks, my class handouts, beginner patterns, and the student yarn. Next I’d like you all to meet Jess. Jess has been helping me as a VA (virtual assistant) for a year now. She’s awesome because she understands me and my brand so well. If you are on my email list (and if you aren’t, you should sign up right now!) or if you’ve seen my social media post this past year you’ve most likely heard from Jess. She writes a lot of my emails and some of my social media posts. This is fabulous for me because I don’t like writing and before she came on, I was never consistent with my emails. So here’s more about Jess. 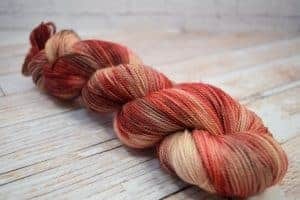 When and how did you get started in the fiber arts? My mom taught me how to knit when I was a child, but I didn’t pick it up with any enthusiasm until I had children of my own. 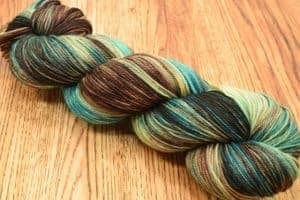 I started off with crochet, and then expanded to knitting and eventually spinning because I found Ravelry and fell down the rabbit hole of fiber arts. That was about 14 years ago, and I’m so glad I did! 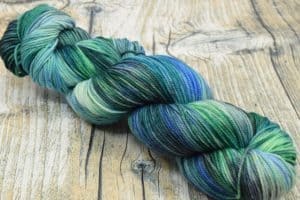 In about 2009, I started my own indie dyer biz – Storied Yarns – and I ran that for a few years before eventually packing up my dyes to pursue VA work instead. I’ve been writing for online magazines and other publications since I was in high school, actually. I was an English major in college, and I taught high school English for a few years but had trouble finding a teaching job when we moved from Florida to Tennessee about 10 years ago. 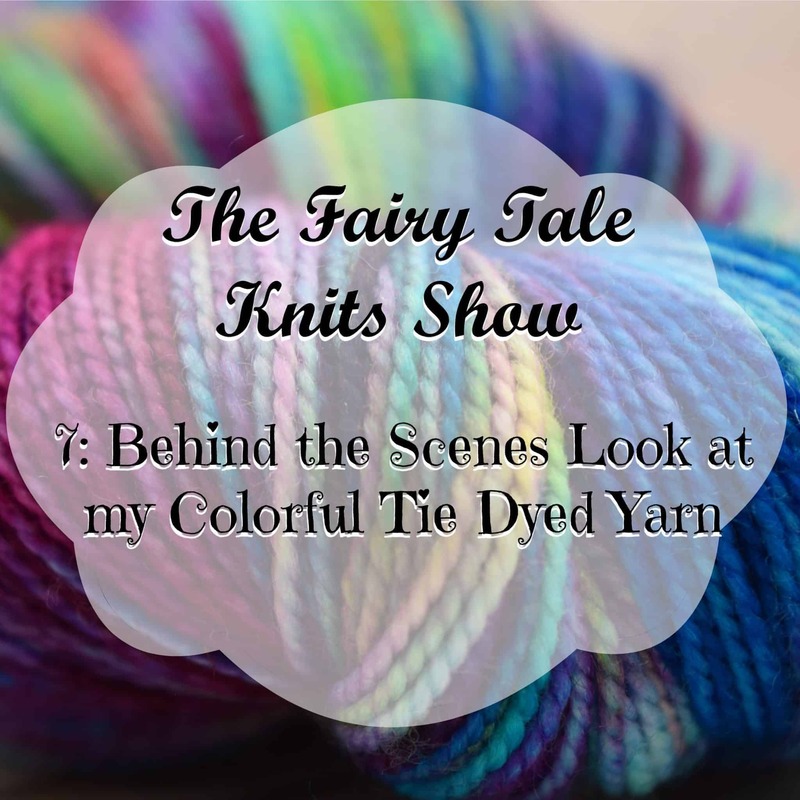 So instead, I found freelance writing jobs online, and I started working on Storied Yarns more seriously. What’s your favorite part about being a VA? It has always been the people. I get to be part of so many amazing and creative businesses, and to “hang out” online with the amazing and creative women behind those businesses (all of my clients, currently, just happen to be women). It’s a real privilege. What’s your favorite project you’ve made? Oh wow, I don’t think I have one! That would be like choosing a favorite book – a nearly impossible task. I like to think of myself as a selfish knitter, but most of the projects that make me smile the most are the ones I’ve made for other people. Hats to show appreciation to my co-workers, a shawl for a grieving friend, a sweater for my niece of a toy for my kids. It makes me feel good to show people I care about them through my knitting and crocheting. 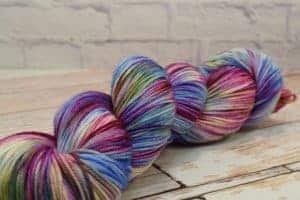 What’s your favorite fiber blend to knit with? I couldn’t do all I do without help. 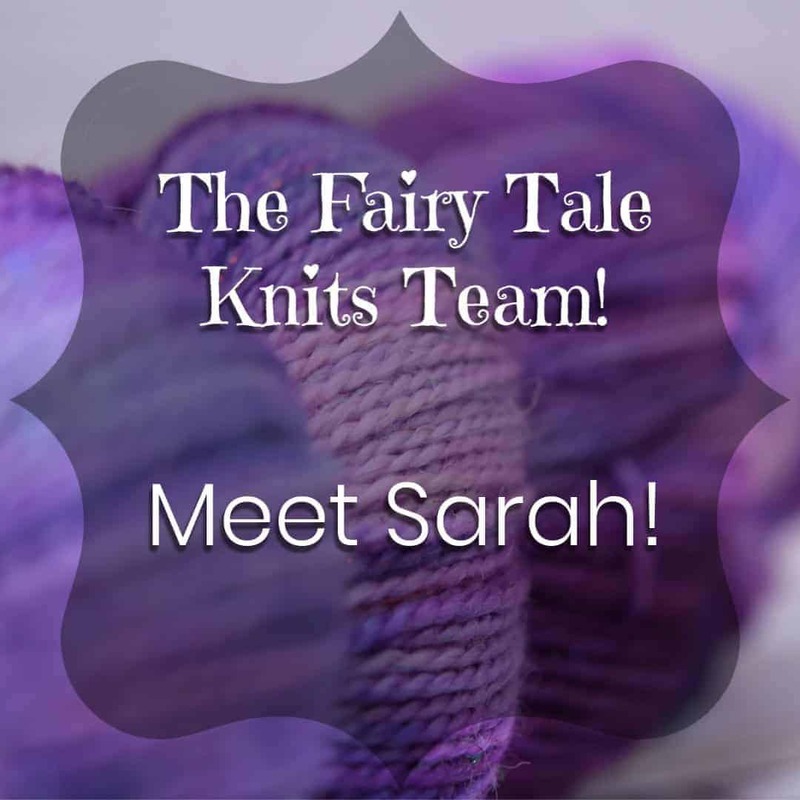 This week you’re going to meet the newest team member, Sarah. Sarah will be writing most of the blog posts you’ll find here. We’ve been friends for over a decade and I’m so happy to have her joinging! I’m learning free motion quilting. I’ve got two baby-sized quilts in progress with different stitching styles planned. Neither has a deadline or a recipient, they are really just practice. If they turn out okay they will get donated to Project Linus. Also, One Act Play season is just beginning, I may get some commission work from the local high schools again this year. (I keep hoping someone does a Regency era play. I’ve been itching to do some of that kind of costuming). In great hopes that by the time this is published I will be done with the Slytherin house scarf for my older daughter. It’s a Christmas present so… not sure what will be next on the needles. 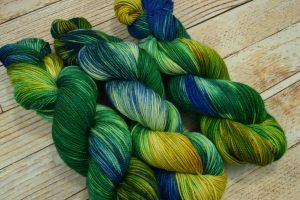 I’ve got some lovely yarns begging to be summer weight tops, but no patterns to go with them just yet. I’m really only an intermediate knitter, it’s the most recently added skill to my repertoire (about 5 years or so) and have a short list of specific techniques I still need to work on. I’m half-way through a simple triangle shawl in a lovely fine yarn in a slightly mottled purple with some grey stripes added for interest. The lacy border will have some grey as well. 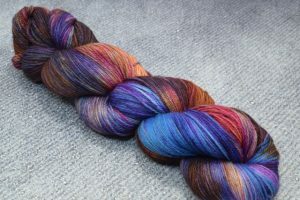 This is a stash buster project and I intend to try and use up all the yarn as it’s a colorway that was ended several years ago. This is for myself, so it’s my ‘in between other things’ project. It’s been on the hook for about seven months so far. I’ve been noodling around with bookbinding techniques. The husband is planning a garden again. He has not accepted the fact that I have a black thumb. 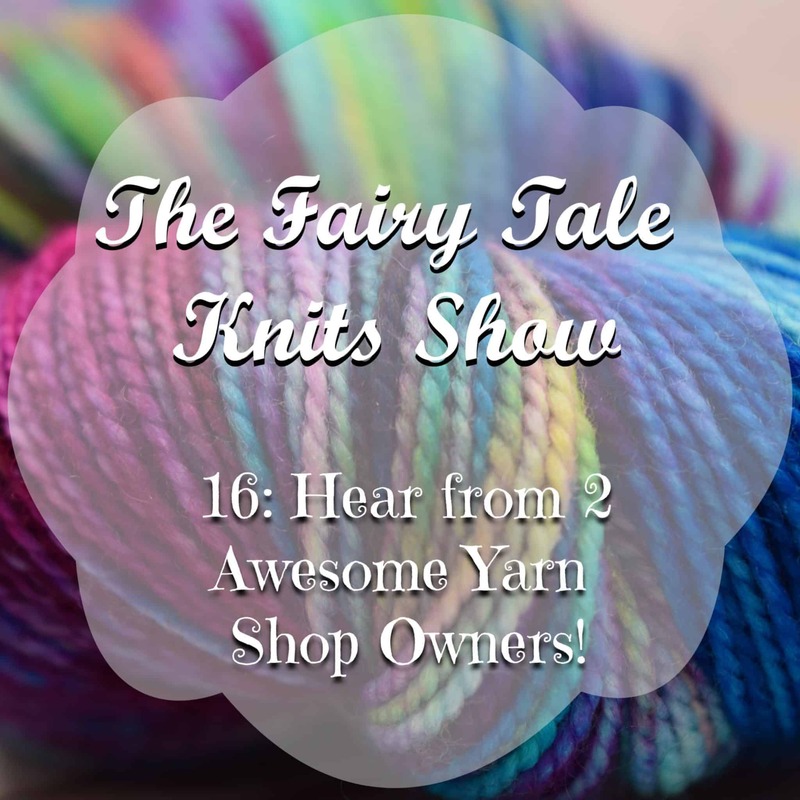 16: Hear from 2 Awesome Yarn Shop Owners! 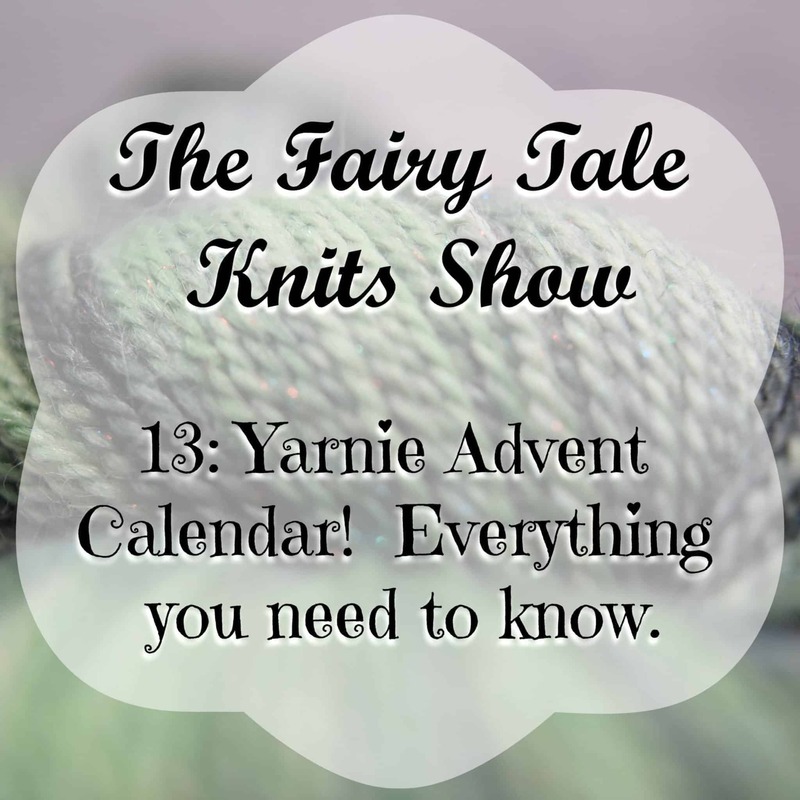 13: Yarnie Advent Calendar! Everything you need to know. I’m so excited to share this with you! On Friday, Oct 12th I’m introducing my first ever Advent Calendar! YAY! So I wanted to talk to you today about how it all works, the theme, how I’ve been inspired for the colors. Next episode I’ll talk to you about patterns that are great for advent calendars. The colors tie together and will be in an order that will fade. 11 are tie-dyed, 11 are speckle dyed, 2 are a mix. If you want to be the first to know about it, join my email list. The entire calendar will ship together to you and be to your house before Dec 1. Each day will have a package that you open. Advent calendar will include 24 minis and 1 full hank of yarn. Colors will be set-up in order to fade if that’s how you’d like to work your project or projects. Here’s the link to the video that talks about Ching Shih, the pirate I mentioned. Join my email list in the link below. It was great talking to Bethany and I’m so excited for the festival this year! Here are links to everything we talked about. You can find links to all the classes here. Here are forms for all things fleece! 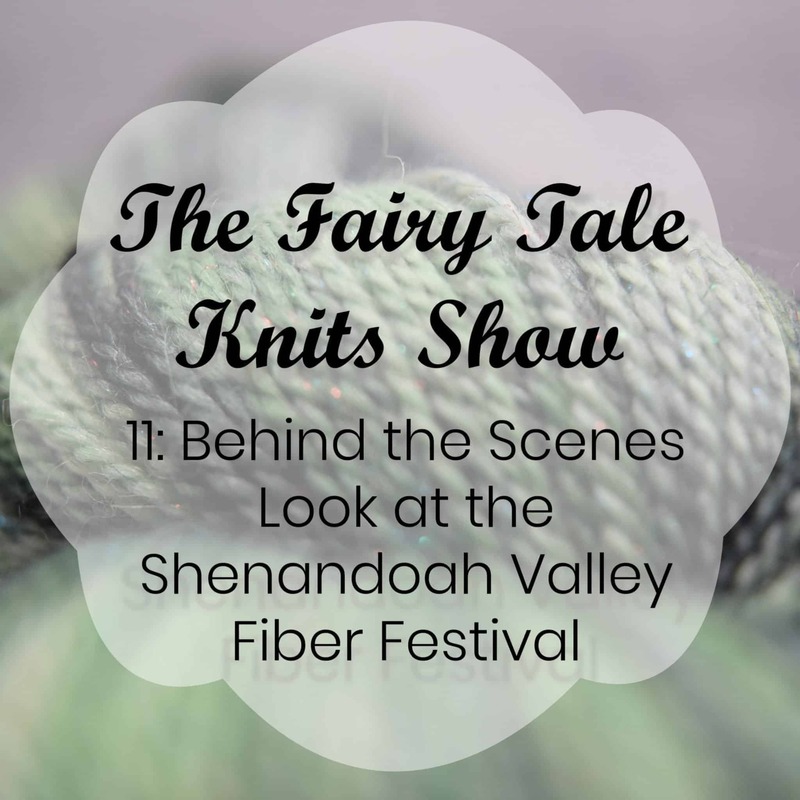 Links to all the special events including Crank In, VA Make it with Wool, Eastern Angora Goat & Mohair Association Fall Show, and the Sheep Dog Demos. You can see all the items in the raffle here. Here’s how you can help at the festival. You can see the large sections of color in these colorways. 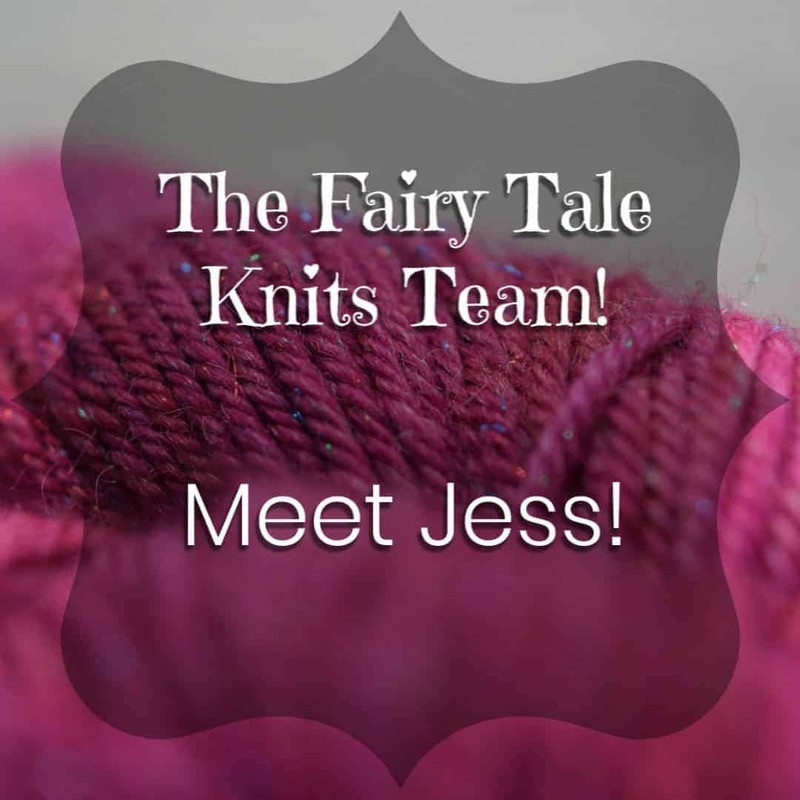 You can be sure you don’t miss out on any of my trunk show by following this link and becoming a Fairy Tale Knits Yarnie! If you want to make sure you don’t miss out on any episodes of my podcast, sign up for this email list and you’ll be notified about every episode. Thanks so much for listening! I’d love if you shared this with all your yarnie friends and I’ll talk to you next week. 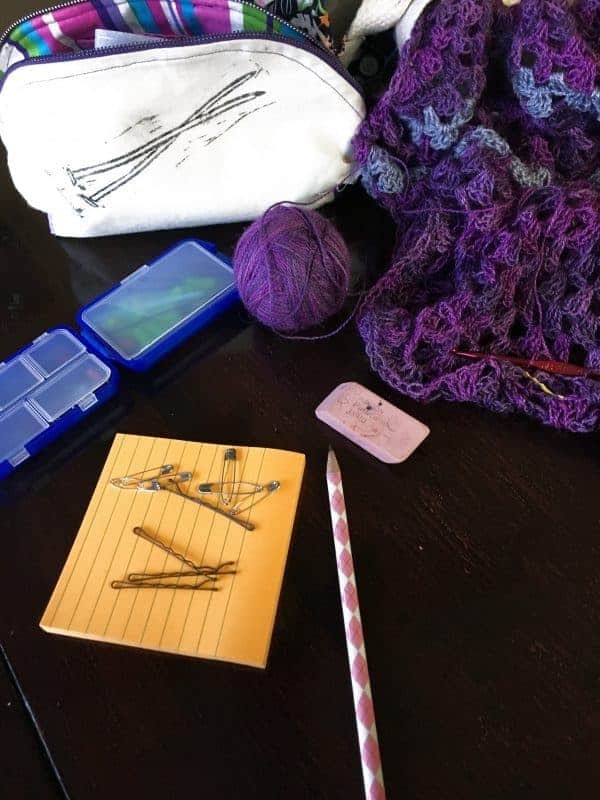 I like to carry the items I use a lot in knitting and just day to day in my bag, rather than having to remember them for specific trips or projects. 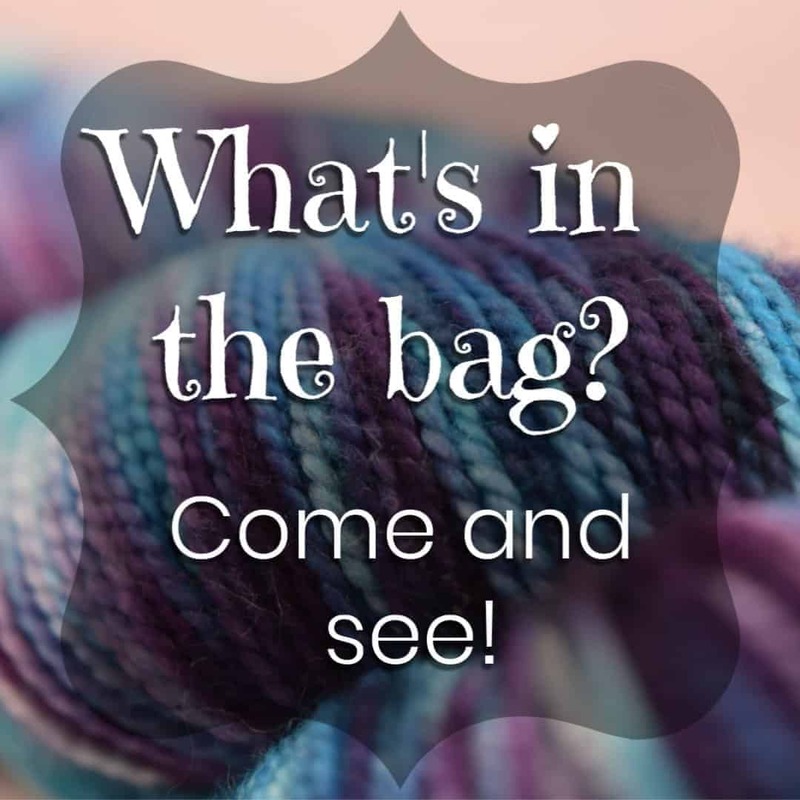 I shared why I love Star Knits bags with you before so it no surprise that I have one of her project bags in my knitting bag. I love keeping my projects in these bags. They are fun and they do an awesome job protecting my work. The plastic bags just didn’t hold up well for me at all and this is a better solution. So I like to keep things I know I’m going to need in my bag all the time. The red tin is where I hold my stitch markers, darning needles, row counters, tightening pins and gripper pad, and needle tips when I don’t have my needle roll with me. This tin was what a wallet I got my husband for Christmas at least 9 years ago. The tin has out lasted the wallet at this point. It’s quite beat up but I love it, it’s perfect. I do need to get another one though because the bottom is looking like it’s not going to hold up much longer. The zipper pouch is also from Star Knits and I have a project bag in this print because I love it. I usually holds my scissors (which have disappeared), but also one of those little crochet hooks for correcting mistakes, a lucet (the wooden U shaped thing with the hole, these make great drawsting cords! ), ruler, tape measure, and chap stick. Now this zipper pouch is cleaned out. It usually has a lot more stuff in it. The silver tin holds my lotion bar, which is important for knitting so my skin feels nice while I’m knitting. And ok the wallet really isn’t a knitting necessity, but it’s really cool. I love the side pockets because they are clear and so deep they hold a lot. Being clear makes every quick and easy to find. Some of these are knitting related and some aren’t. I’ll start at the top. Wooden heart needle gauge that my daughter bought me for Christmas, Sock ruler because they are awesome. There’s also a pink tape measure, my battery back up, one of my Nostepinnes, another tube of chap stick, another rubber gripper on top of a plastic container. The container holds my Pyure sweetener packets, some tea bags, and my daughter’s dairy pills. Then there’s some toy cars for my sons at restaurants and such, more stitch markers, needle size ID tags, some My Little Ponies, and a purple tape measure. So there you have it! That’s what I carry in my bag. I don’t always have this many tape measures, usually one or 2 or sometimes all 3 are lost. So what do you carry in your bag?